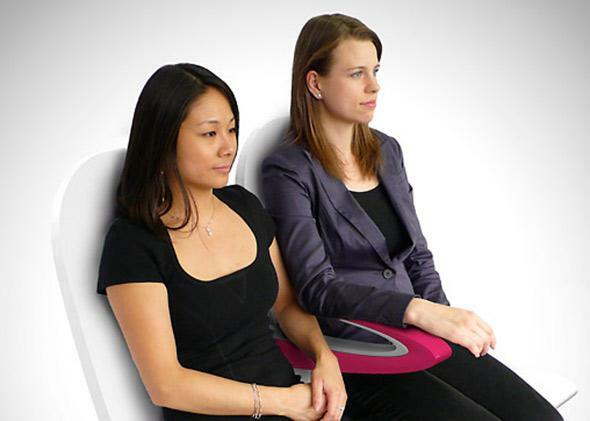 Paperclip Design creates an armrest, airplane chair that every airline should use. No need for glares or passive-aggressiveness here. Some of my favorite uses of technology help solve problems in the physical world. When apparel-makers started selling no-iron shirts, for example, I was overjoyed. And as a frequent traveler, I’m constantly on the lookout for gadgets and enhancements that make airports and airplanes less of a hassle, which is one reason why I never, ever leave my noise-canceling headphones at home. I fly a lot, and while I sometimes get an upgrade, I’m resigned to ending up mostly in what U.S. airlines amusingly call “economy class,” or coach. The carriers have determined that Americans care about one thing only, the alleged ticket price—“alleged” because airlines have found all kinds of tricky ways to tack on extra charges that don’t appear in the list price. The airlines have also taken to squeezing more and more passengers into the same amount of space, by reducing seat size and legroom, and then feigning surprise when fights erupt after traveling jerks block others from reclining their seats. Enter Paperclip Design and its director, James Lee. His specialty is airline seating, and he’s doing some innovative things—enough so that he’s won some industry awards and laudatory press coverage—that I hope the airlines will consider adopting. When I learned that he’s based in Hong Kong, where I’m currently a visiting university lecturer, I took the opportunity to stop by his office and workshop to see for myself. Given that airlines spend as little as possible to make coach passengers happy, the invention that is least likely to show up on your typical carrier is probably the most needed: a coach armrest that could ease one of the little battles we fight with the people next to us. As the photo shows, it’s elegantly simple: a curve that creates upper and lower armrests. People of similar heights might want the same one, but it’s easy to imagine a happy detente where both parties end up with what until now has been a source of dispute or at least discomfort. Lee, 30 years old, is a mechanical engineering graduate of the University of Hong Kong (where I’m teaching a short course at the Journalism & Media Studies Centre) and has master’s degree from MIT, where he says he got interested in aviation and seating in particular. He worked for Cathay Pacific, the huge international carrier based in Hong Kong, and struck out on his own a few years ago. He and a group of friends—designers and engineers—work out of a shared space in the Fotan neighborhood of Hong Kong, a long way from the city’s center but also a lot more affordable, given local rents that can charitably be called insane. Lee probably has a much better chance of getting airlines to pay attention to one of his more recent ideas, in part because earlier this year it won an industry award that included a $25,000 check. It’s called the Butterfly, a modular seating system that could make what many international carriers call “premium economy” seating more adaptable based on demand, and more profitable. Premium economy is a class in between cramped coach and spacious business class, with wider seats and more legroom; don’t confuse it with what United Airlines calls “Economy Plus,” which is a regular coach seat with a few inches more legroom. The Butterfly turns two premium economy seats into one full business-class seat. This means an airline could quickly reconfigure an individual plane’s cabin to generate the most revenue for an individual flight. The original name for the convertible seat was the Caterpillar, signifying the creature’s transformation into a butterfly. But in a sign of our litigious times, Lee changed the name to Butterfly, after the American heavy-machinery company called Caterpiller sent a cease-and-desist letter claiming he was infringing on its trademark. However ridiculous that claim might have been—and it sure sounds absurd to me—Lee felt obliged to comply, because he says he’d have had to spend an estimated $200,000 to win his case. The Butterfly doesn’t yet exist as a full-sized seat. Lee has a scale model and, of course, sophisticated computer models. Like so many other modern objects, computer-aided design is a key ingredient even if the inspiration comes from a human. Algorithms are especially essential for a design like this, given the space limitations inside a plane cabin. When every fraction of an inch matters, software gives designers an almost infinitely malleable canvas.